I have been with BCRC as the new Intake Specialist for a bit over three months now and am really enjoying my new role. While on the job hunt, having worked in the non-profit sector previously, I knew I wanted to stick with it and find an organization that really impacts the community. BCRC and its staff of driven and inspiring women do just that and I am very fortunate to be a new member of the team. I was born and raised in Oshkosh, Wisconsin and attended the University of Wisconsin-Milwaukee where I earned a degree in Community Engagement & Education and a minor in Spanish. I spent some time studying abroad in both Mexico and Chile and, upon graduation, moved to Chile where I spent a year working and trying to improve my Spanish skills. Once back in the States, I lived in Wisconsin for one year and after another brutal winter, I knew it was not for me. I moved to Austin in August 2013 and I’m thrilled to call this city my new home. As the bilingual Intake Specialist, I am a new client’s first point of contact in either English or Spanish. Most clients are scared and overwhelmed when they first call so I have to be the calm in their storm. I match clients to one of our patient navigators, provide callers with information on who we are and what we do, and much more. Another big part of my role is to manage BCRC’s free mammography program, which provides mammography and diagnostic assistance to underserved and uninsured women of Central Texas. Being new to the area, one of the biggest challenges of the job has been becoming familiar with the organizations, clinics, and medical professionals that we work closely with. Slowly but surely their names and locations are sticking with me. 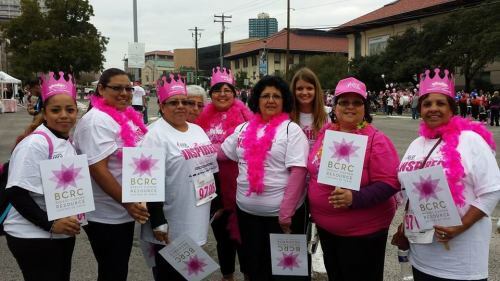 Joining BCRC during the busy month of October – Breast Cancer Awareness Month – was both overwhelming and exciting. I was able to attend some of the Locally Pink Campaign events, the Remembrance Ceremony, and was the BCRC Team Captain for the Susan G. Komen Race for the Cure. These events gave me the opportunity to not only spend time with my new co-workers, but also meet many of our clients, gain a better understanding of all that BCRC does, and witness the great impact that the organization makes on the lives of those affected by breast cancer.